Corne (Horn) guitar pick, Guitar Pick/Plectrum from Rocky Mountain Slides. Vehuel's review (This content has been automatically translated from French)" Excellent in rhythm!" 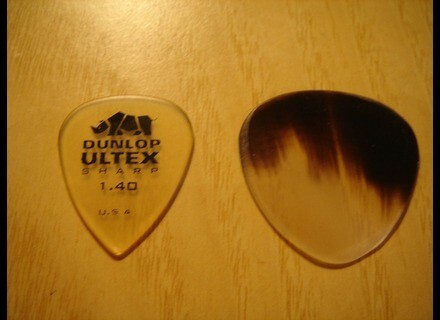 The pick of buffalo horn is transparent, with a few shades of brown. It is much more imposing than coconut, which was a little larger than a standard pick. With large hands yet, pick it asked me for a little time to adapt, due to its size. However, it is straight, not curved like coconut. The edges are rounded and not sharp as when the tip of the pick is worn after a few hours of play is fine Souplet. It is therefore a special design to pick and tips can be a disadvantage for the accuracy lead, but I used to play picks worn, rounded, so it is playable. At her, I find this material interesting because the attack of each note is "rubberized" soft compared to other materials, but the sound is clear, given the thinness of it. It is very easy to blow shades depending on the game right hand, softer than this, but without being aggressive. The sound is "totally" mat, unlike coconut pick which emphasizes the bass while shining treble. We note that especially in overdrive. At the sound spectrum, it is therefore low value. For solo play, the sound is not bad, but it is especially rhythmic / overdrive sound the pick makes its fullest extent. We find the dark side of the horn, and the sound is incredibly soft. On my folk, I find the sound quite open solo, it emphasizes the midrange without shine. In contrast, agreements, there is the dark side mat and that was on electric guitar. In the end, pick, its shape and especially by its rounded edges, be better suited for rhythmic solo. Remains to be seen the wear coefficient, I already have some wear on the edges after a few hours of play, but because the sound, especially considering the price, it's worth it!